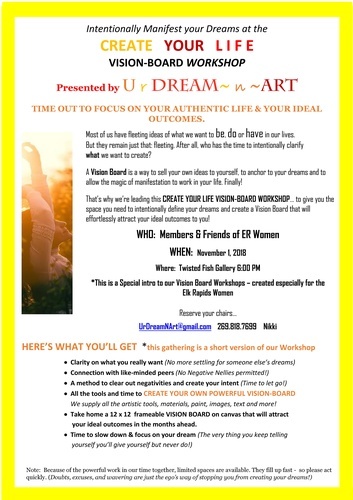 Intentionally Manifest your Dreams at the CREATE YOUR L I F E VISION-BOARD WORKSHOP Presented by r ~ n ~ TIME OUT TO FOCUS ON YOUR AUTHENTIC LIFE & YOUR IDEAL OUTCOMES. HERE’S WHAT YOU’LL GET *this gathering is a short version of our Workshop Most of us have fleeting ideas of what we want to be, door havein our lives. But they remain just that: fleeting. After all, who has the time to intentionally clarify what we want to create? A Vision Board is a way to sell your own ideas to yourself, to anchor to your dreams and to allow the magic of manifestation to work in your life. Finally! That’s why we’re leading this CREATE YOUR LIFE VISION-BOARD WORKSHOP... to give you the space you need to intentionally define your dreams and create a Vision Board that will effortlessly attract your ideal outcomes to you! WHO: Members & Friends of ER Women WHEN: November 1, 2018 Where: Twisted Fish Gallery 6:00 PM *This is a Special intro to our Vision Board Workshops – created especially for the Elk Rapids Women.